Inseparable twin sisters doubled the romance when they married the best friends they went to school with - by sharing their amazing wedding day. Mairead and Siobhan Ryan, 33, from County Tipperary, married their teenage sweethearts, Robert Harris and Tommy Hogan, in a lavish joint ceremony in June this year in Clonmel, Ireland. Meeting at Cashel school when they were all 16, the twins quickly paired up with pals Tommy and Robert and started dating. Siobhan was shocked to discover that Tommy – who she has two children, Tommy, seven, and Emily, four, with - was her senior by just a day and had been born in the same hospital room as the twins. But not everything they have done has been quite so synchronised. Carer Mairead and media executive Robert were engaged in 2008, after the birth of their son, Bobbie, now 12. But it wasn’t until 2015 that Siobhan and her now husband followed their example, after plasterer and painter Tommy got down on one knee, during a trip to Paris. Back home in Ireland, rather than having a long engagement, like Mairead, her sister planned to walk down the aisle in 2017. 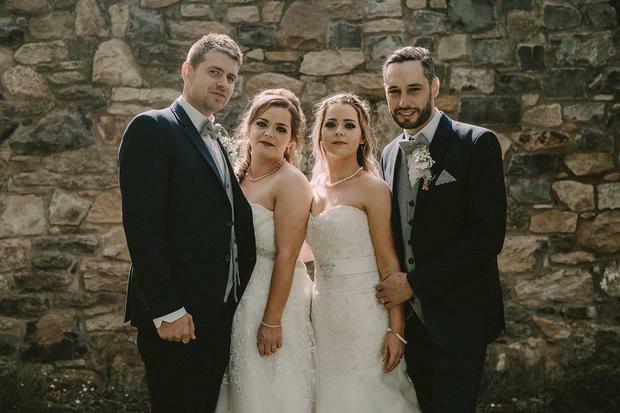 Hearing about Siobhan’s wedding plans clearly spurred her twin into action – leading to them planning nuptials just months apart.When they discovered this, they decided to combine their efforts and their finances, to give them the wedding of their dreams. “I think the planning spurred us on to finally do it, too," said Mairea. "We wanted an autumn wedding in 2017 and they were planning a summer one. But we realised that a lot of the same people would be at both, so it seemed crazy to be paying for separate venues and everything. “Someone just sort of naturally suggested we join forces. I’m not really sure who, but it became a mutual decision to have a double wedding. "Always very close as twins, we share a lot of the same friends and obviously the same family, so it made perfect sense." By combining finances, they were also able to have a much more elaborate ceremony and reception at Raheen House in Clonmel, Co Tipperary – a beautiful historic hotel, dating back to the 17th century. In the build up to the big day, the twins even helped to choose each other’s bridal gowns. And when the big day arrived, the sisters provided moral and practical support to each other throughout the preparations. Finally, as the grooms waited for them at the top of the aisle, the twins’ other sisters Michelle, 37, Sinead, 35 and niece, Ciara, 15, joined the wedding procession as bridesmaids. But Mairead, who was given away by their mum Christine, and Siobhan, who was given away by their dad Denis, 63, stole the show in their fabulous ivory gowns. “She’s five minutes older, so of course I had to let her go first,” Siobhan joked about her twin. Afterwards, the couples and their guests partied the night away with a DJ and a band, at the venue, although only the Harris newlyweds had a first dance. Following the big day, they decided to honeymoon separately, to make sure there was someone to look after their children. Siobhan said: “Mairead and Robert went to Lisbon in Portugal for a week afterwards, while we went on a mini-moon to Killarney, in Ireland, so we could look after each other's kids."